For the past 21 years, we have been helping Orange County residents get in shape and feel great about themselves. We provide a variety of workouts to meet your current fitness levels and health goals. While we are proud of the quality services we offer, we are even more proud that our customers agree. They have given us excellent feedback and reviews. Whether it's a clean facility and friendly environment, or the quality and personal care our trainers offer, our clients and customers love us. Our customers have spoken up about our . . . Check out what your friends and neighbors are saying about us . 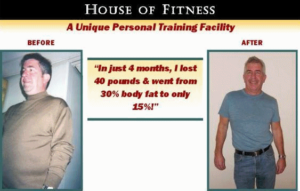 . .
"In just 4 months, I lost 40 pounds & went from 30% body fat to only 15%!"